Who’s the second-most popular member of the world-champion Cleveland Cavaliers? Maybe, but it just might be Larry. That’s what the Cavs’ trophy handler and security person call the Larry O’Brien Championship Trophy. And Larry was on display as part of the Cavs Fan Fest before the team’s preseason game Tuesday night against the Washington Wizards at The Ohio State University’s Schottenstein Center. The Wizards topped the Cavs 96-91. The Cavs most-popular player, LeBron James, had a team-high 18 points despite only playing a few minutes in the second half. Kevin Love had 15 points and Tristin Thompson added 14. 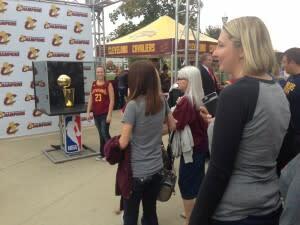 Larry attracted quite a crowd of admirers, as hundreds of Cavs fans waited in line to get a look and pose for photos with the gleaming, golden symbol of NBA excellence that has rejuvenated long-suffering Cleveland sports fans. “That’s Larry’s home,” the security person said, pointing to a big, black trunk sitting behind the trophy. It didn’t seem to have any air holes. “We’ve been everywhere, all over the state” the trophy handler said, adding Larry has made about 150 stops in Ohio since the championship game. He was at Cedar Point, but didn’t go for a ride. He was in Akron, and did go up on a blimp – and may have gotten a little airsick. Larry and Cavs coach Tyronn Lue made an appearance at the OSU football team’s practice on Monday, and Lue talked to the Buckeyes about comebacks. And on Tuesday, before the game, Larry was at the Statehouse in downtown Columbus, where anestimated 5,000 people got a chance to see some history. “It weighs 14.5 pounds, is made of sterling silver with a 24-karat overlay and the ball is almost a regulation-size basketball,” the trophy handler said. Why is Larry so popular? Let’s check with some of the people who waited in the line to see the trophy. Patricia: “It’s history, the first (Cleveland) championship in 52 years. With the exception of Ohio State, we don’t get many.” She watches the final minutes of Game Seven over and over on YouTube. “I still get nervous every time, like I don’t know how it ends.” Fortunately, it ends the same way every time: Cavs win! Wesley: “It’s like a dream come true for every fan.” Wesley was at the game with his brother, sister and parents, who also posed with Larry. 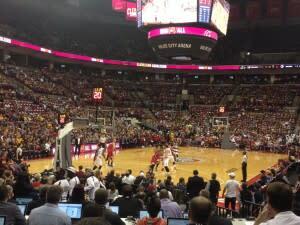 Notes: The Schott is the Cavs “home away from home” and the team has played preseasons game here for a decade. Attendance on Tuesday was 18,104. This was the team’s final preseason game. The Cavs open the season – and the defense of their NBA title – on Tuesday when they host the Knicks. “Everyone came out (of the Tuesday game) healthy … and now we’re ready for the regular season,” Lue said. The game was a homecoming for Trey Burke of the Wizards, who played for Northland High. Burke had 8 points and 4 assists and appears settled into his role as the backup for All-Star John Wall.